In the spring of 1983 Terry Tempest Williams learned that her mother was dying of cancer. That same season, The Great Salt Lake began to rise to record heights, threatening the Bear River Migratory Bird Refuge and the herons, owls, and snowy egrets that Williams, a poet and naturalist, had come to gauge her life by. One event was nature at its most random, the other a by-product of rogue technology: Terry's mother, and Terry herself, had been exposed to the fallout of atomic bomb tests in the 1950s. As it interweaves these narratives of dying and accommodation, Refuge transforms tragedy into a document of renewal and spiritual grace, resulting in a work that has become a classic. 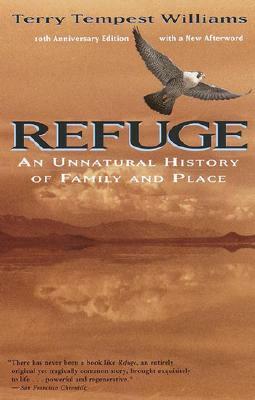 "There has never been a book like Refuge, an entirely original yet tragically common story, brought exquisitely to life." "Moving and loving... both a natural history of an ecological phenomenon [and] a Mormon family saga... A heroic book."